Black-Eyed Peas are small, beige legumes with a black eye in the center of one side; while termed "peas," they are actually beans. They are considered good luck in the American South, and eaten as part of New Years celebrations. Black eye pea is pale-colored with a prominent black spot.. It is oval shaped. Colors: it is pale cream -colored with a prominent black spot. Choosing: Choose ones which are small ,hard and pale coloured. Buying: Available in all supermarkets in raw form and almost always in the frozen food section. Procuring: This heat loving crop should be sown after all danger of frost has passed and the soil is warm. Seeds sown too early will rot before germination. 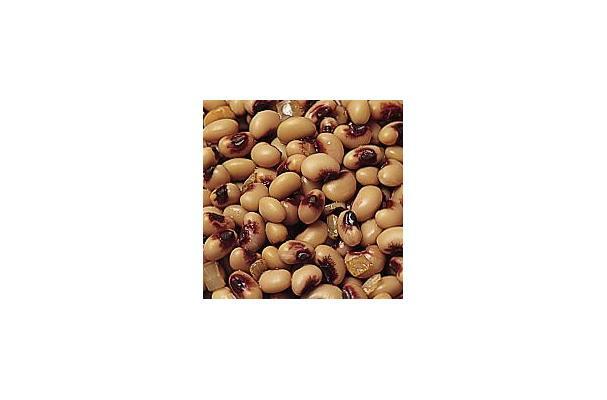 Black eyed peas are extremely drought tolerant and excessive watering should be avoided. The crop is relatively free of pests and disease. Root-knot nematodes can be a problem, especially if crops are not rotated. As a nitrogen fixing legume, fertilization can exclude nitrogen three weeks after germination. The blossom produces nectar plentifully and larger areas can be a source of honey. Because the bloom attracts a variety of pollinators, care must be taken in the application of insecticides to avoid label violations. Depending on the source, you may need to sort through the dried peas to remove stones, bits of dirt and other debris. Before cooking, rinse in a colander with cold water then soak for 2-3 hours or overnight. This will reduce cooking times and make them easier to digest. Use of a pressure cooker will also speed up cooking time. To prepare for general use boil in water, with a bit of salt, until tender. Cleaning: Does not require much of cleaning but has to be preserved well. It has to be stored in large Jars. Its is eaten year round across the world . History: Originally native to India , but widely grown in many countries in Asia, the black-eyed pea was introduced into the West Indies and from there to the Southern United States as early as the 1600s in Virginia. Most of the black-eyed pea cultivation in the region, however, took firmer hold in Florida and the Carolinas during the 1700s, reaching Virginia in full force following the American Revolution.The crop would also eventually prove popular in Texas. Throughout the South, the black-eyed pea is still a widely used ingredient in soul food and various types of Southern U.S. cuisine. The planting of crops of black-eyed peas was promoted by George Washington Carver because, as a legume, it adds nitrogen to the soil and has high nutritional value.